Today I have blogger Vivian with me. 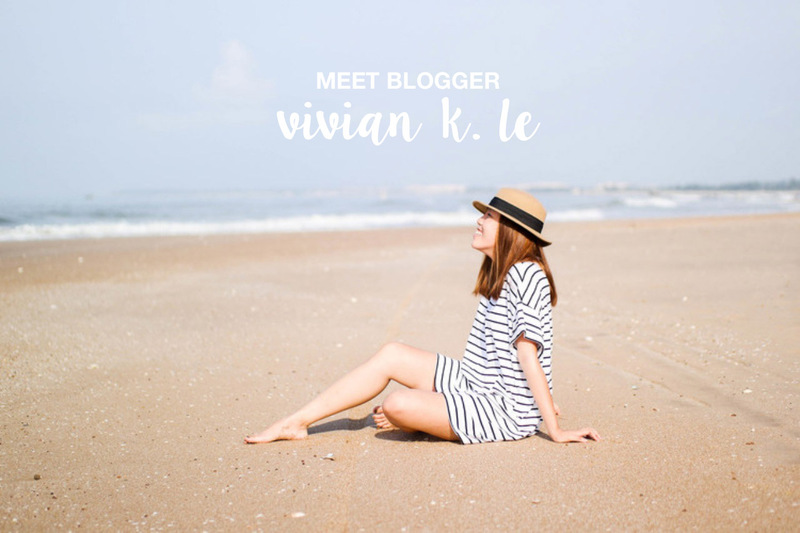 I first discovered Vivian through reading comments and fell in love with her blog after first glance. Her photography is super pretty and she's been writing about her travel experiences in Vietnam which is really fun to follow along to. What gravitated me towards her is her kindness and how genuine she is. I really appreciated her kind words and how she wasn't just commenting on another blog just to gain more attention. After emailing her, we decided it would be an awesome idea to do some sort of collab together and here it is! Keep reading to find out some of Vivian's fall essentials and beauty secrets! 1. What are three essentials for you this fall? My three essentials for this fall would have to be a leather jacket, a trench coat, and a good pair of leather pants. 2. Do you have one advice for other bloggers starting out? Honestly, my advice for new bloggers would have to be: be yourself and post content that you as a reader would want to read. Also, don't take it too seriously and have fun with it! 3. What made you start your own blog? I started my own blog because I genuinely enjoy writing and photography. I love the whole process of taking/editing pictures, so it only made sense to combine all my passions together and create a blog. And at that time, I was an incoming senior in high school and didn't have anything else better to do with my time haha! 4. Tell us one of your beauty secrets! I'm pretty lacking in the beauty department, but my number one beauty secret would be using Vaseline as my makeup remover. I always forget to restock my makeup towelettes so Vaseline comes pretty handy when it comes to cleaning those smudgy mascara residue. 5. Who are some of your favorite bloggers right now? I love reading blogs, so I have lots! But I think my favorite blogs right now would have to be Irina from "A Portable Package" and Dylana from "Dylana Suarez." Irina has such a chic and 70's killer style, I'm always drooling when I'm on her blog. And as for Dylana, she never fails to mesmerize me with her chill boho style and ahhhmazing writing. Love them both! To be honest I don't really have a meaning behind my blog name. It's literally just my whole name: Vivian Khanh Le aka Vivian K. Le. Haha I know, so original. 7. Name 3 'holy grail' items in your closet? This is hard because I consider all the clothes in my closet my holy grail! Haha but if I could only pick 3 items then it would have to be my flare jeans from Lucky Brand, my brown suede ankle booties from Franco Sarto, and a striped shirt. I have quite an obsession with stripes so I pretty much can't live without them. 8. How would you define your style? I don't usually gravitate toward a specific style. I'm always experimenting with different styles, but I would have to say I'm very minimalistic. I like to keep things casual and pretty neutral most of the time (all the time). Miranda Kerr, hands down! Been a fan and will always be a fan. How can someone be THAT chic all the time?! 10. Where do you see yourself and your blog a couple years down the road? Don't forget to check her blog out here!